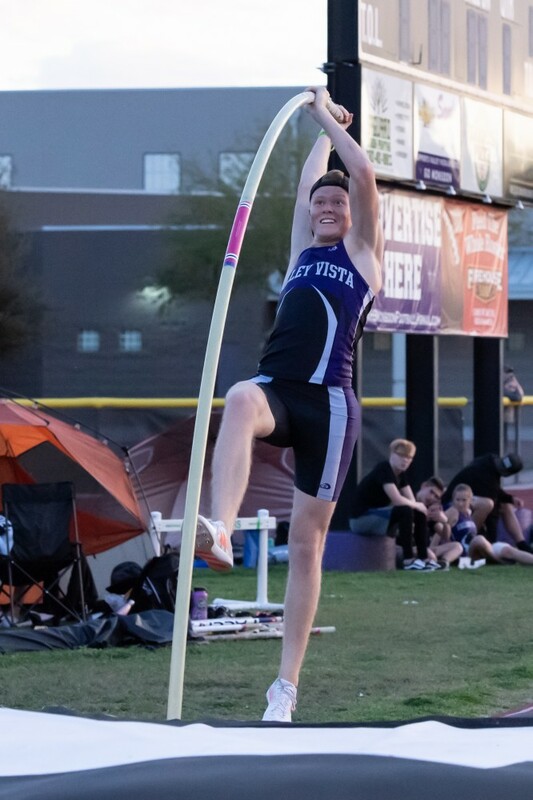 Oddly enough, Valley Vista senior Tim Ellis can win the school’s first state pole vault title — and win it quite comfortably — without coming close to breaking the school record. Such is the lot of the next great Monsoon vaulter following in the wake of Cole Riddle. Two years ago, Riddle set a new state record and broke it again his final month at Valley Vista — jumping 17-7 in his final high school meet. However the current ASU pole vaulter competed on an extremely windy day for the 2017 state meet and cleared only 15 feet. Ellis is hoping for calmer skies when he competes at state May 1 at Mesa Community College. In some ways, Ellis’ career path has mirrored Riddle’s. Both took the discipline up as freshman and benefited from the coaching of Valley Vista’s pole vaulting specialist Rick Scaife. Scaife said he is in his 12th year with the Monsoon. “I started with football and I was way too small for that. I moved onto wrestling and was also pretty bad at that. Then I went to track and I saw some of the pole vaulters and thought that it looked like a lot of fun,” Ellis said. He was not polished. But as a self-professed “adrenalin junkie,” he was already halfway there. Ellis jumped 11-3 his freshman year. He also benefited from having Riddle, then a junior, there. “It’s just like playing up in basketball, when you surround yourself with more talented players. He had the perfect model to watch,” Scaife said. Then Ellis followed Riddle’s lead in gaining another ideal role model. Nick Hysong — 2000 Olympic pole vault champion, former state record holder and Riddle’s coach — started working with Ellis in the summer. Ellis said he gained strength after that offseason. He did not clear a height on that windy 2017 day. The next year, however, he established himself as the Division I favorite early. Ellis was tops in the state for most of the season, then late that spring another vaulter bested his mark by an inch. At state in 2018, Ellis placed sixth on another windy day, vaulting 13-9. He finished much better in the meet of champions the next week, clearing 15-6. Ellis said his focus this year is more on the state record that the Division I title. “Breaking the state record is my goal and it seems impossible. But seeing someone physically break it makes it seem a little more possible,” Ellis said. His run got a lot better and he is ready for bigger poles now. Breaking Riddle’s record will be tough but Scaife believes Ellis he can get close. Ellis set himself apart by clearing 16 feet to win the Sun Angel meet early this month in Tempe. “It’s a four-inch personal record, which is big. But my vault wasn’t technically great. I think I could have gotten six inches, maybe even nine inches, higher,” he said. Ellis hopes to go to a Division I school on a full-ride scholarship, which is rare in track. He wants to study business. Fresno Pacific University has offered Ellis a full ride if he clears 16-6. He said Alabama coaches also spoke to him. Scaife said colleges tend to be stingy with track scholarships with pole vaulters. But he said he believes Ellis can earn one.